Sitting down to write, as I do today, I’m all too aware of how my thoughts might be perceived and interpreted. I know (or at least I think I know) what the audience is likely to read into it, and so I edit, adjust, and omit accordingly. By the time the finished product is delivered, its character has been shaped by deliberation and second-guessing, with many of my original thoughts removed for the purposes of clarity, cleanliness, and convention. Children, depending on their age, still exhibit the precious quality of true free association, and an honesty too radical to survive into adulthood. They let their minds take them to places that are wondrous and unbounded, but perhaps useless and irrelevant to a pragmatic adult. The results of this mind-spilling are frequently quite interesting, often hilarious and sometimes disturbing. I was lucky enough to be spared that particular kind of imagery. Any tanks and helicopters in my head came from movies. Thankfully my mother kept a good sample of the creative works of my sister and me. As you will see from the following masterworks, I have been an accomplished writer for over twenty years. At eight I had limitless creativity, and immaculate penmanship. Tragically, just as Holden Caulfield so sorely lamented, the rules and politics of adulthood indeed corrupt absolutely, and thus my work has become trite and derivative. I could never come up with stuff of this caliber today. It’s not the thought of sending crocodiles into space that I find so hilarious about this one. What impresses me is the fact that I was so pent-up with creativity that I couldn’t even finish writing the full date before I burst into a revolutionary steamship design. I was already hopelessly obsessed with spectacle and detail. The crocodile suit was quite logically crocodile-shaped, but the spaceship required much more sophistication than NASA’s boring pencil-straight Saturn V rocket. Commander Croc needed two additional rockets because, to him, the moon was too close and familiar to be interesting. Only a journey to Pluto could satisfy his wanderlust. I think I very successfully communicated the entire contents of my mind on November 1st. I also had a habit of drawing in the margins that infuriated my teachers. The above shows mild examples, but you can see the outline of the next days’ out-of-control artistry through the page. 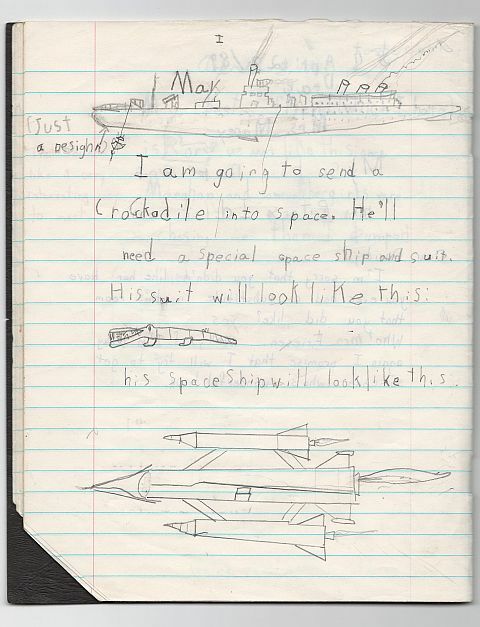 I think a good 75% of my drawings were of rocketships. My dad, a science teacher, was always giving me science lessons, and I passed them on to anyone who would listen. If you didn’t know what the deal was about fossil fuels, you do now. A child quickly discovers another sometimes troublesome source of information about himself: the opinions of others. Other people will tell you what you are, beyond what you can sense for yourself. If everyone says the same thing you can’t help but agree with them over time. These are the bricks and mortar of the ego. 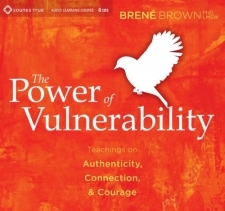 Each of us develops a stubborn, oversimple idea of who we are, composed of our own self-assessments, almost all of which are rooted in what someone else thinks about who we are. Conceit, self-loathing and identity crises all begin here. 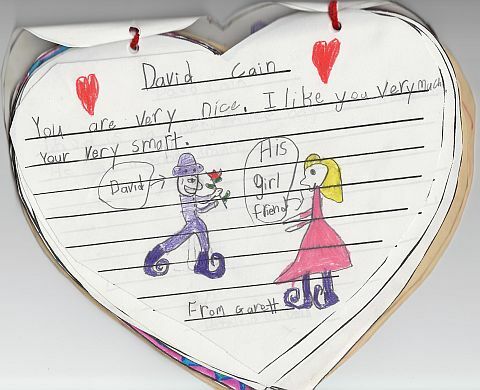 On Valentines Day, 1990, we were asked to write three things we appreciated about each other kid and write it on a paper heart. A little book was assembled for each person, full of other people’s impressions. I’m not sure if Garett was admiring my popularity with the girls, or trying to get under my skin. It was not cool to like girls at that point in our development. Notice my genuine smile, and sequined pimp hat. I have mentioned that I was obsessed with Indiana Jones. But I wasn’t the only one! I love this one because of what came to my best friend Matt’s head when he thought of me: the two of us, collecting rocks and rolling beneath the playground equipment. In our minds we were dodging boulders and recovering lost artifacts. That unpretentious kind of freedom to make-believe, so easily enjoyed by kids, is now dead and gone. We lose it gradually, like our baby teeth. Adulthood does bring certain practical freedoms with it: we can live how we want, where we want, eat ice cream for dinner if it suits us. But there is a specific kind of freedom that is simply too delicate to survive adolescence. Those were some of the best times of my life. 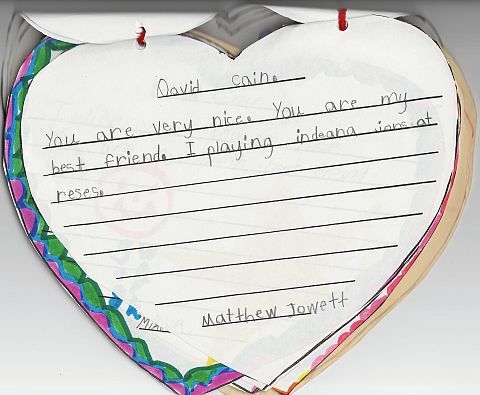 I playing with you too, Matthew. Well, it’s unanimous. I’m nice. It always warmed my heart to know that I was Mike R’s fourth best friend. This stuff is priceless. Memories are lovely, but you can’t just conjure up a picture of the feeling and energy of childhood with thoughts or even Polaroids of you. You need hard evidence of what was in that little head. Each word, crayon-stroke and eraser mark reveals a beautiful little clue about what that tiny mind was like while it was still new. You can spend your adult life making a fortune, traveling the globe, conquering nations even, but no matter what you do you just can’t see the world like a kid again. But you can get a vicarious taste of it when you look at your own handiwork. Hopefully you’ve got some relics like this to cherish. If you don’t, make sure your kids do. It was nice seeing these old school work items. I used to have some up until about 3 yrs ago, when I moved houses. I had several boxes of such collections, and I could only keep a couple. But the ones I have now, I believe are the most valuable to me. They bring back good memories. .-= Shamelle- EnhanceLife´s last blog ..Harry Potter Author J.K Rowling: On Turning A Great Story Into A Billion-Dollar Franchise =-. I certainly don’t have all of my old stuff, but I have some great pieces. I think it’s good not to look through it too often, otherwise it might become a little too familiar. OMG, I love this post. Over the past few months I’ve been reading through my old journals and it’s amazing (and sometimes sad) the things I used to think/write. I need to look at stuff from when I was even younger and have a good laugh. Great post! .-= Positively Present´s last blog ..a vacation state of mind =-. Thanks Dani. Sometimes they are sad. I wrote a book about my dog in first grade, and halfway through the story she died, so half the book is about her dying. At the time i was just writing what I was experiencing, but looking at it now it’s quite sad. Great post, David! 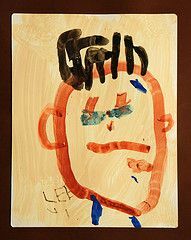 I went to art lessons twice a week between the ages of 5 and 19 and I have all the stuff I created still. It’s an amazing documentation of my life/ emotional well-being, etc. And you’re right that the best part is the uncensored honesty. When I get confused about what I want/ what’s important to me, looking through my old art works is a great way to find my way back to my Essential Self! .-= Cath Duncan´s last blog ..Beliefs for Thriving in Uncertain Times =-. For sure. I love how I just drew or wrote whatever I wanted. There was no deciding, just pure creativity. I’m afraid I don’t think I could ever do it like that again. Great post! Makes me want to explore my old grades school work next time I’m visiting my parents. .-= Nancy´s last blog ..The voting is OPEN! =-. Do it! It will be a real trip. Those masterpieces are indeed a beautiful treasure, I think I have some of those too, from when I was starting to write, ha! Great stuff! .-= Rosa´s last blog ..Charlie Manuel =-. Yeah the fake backwards S is pretty pathetic. It’s such a lie. This is really nostalgic. I can’t tell you the number of times I’ve referred back to my children. I used to be somewhat of an artist back then. I think I was the best drawer in class. My friends told me so ;). 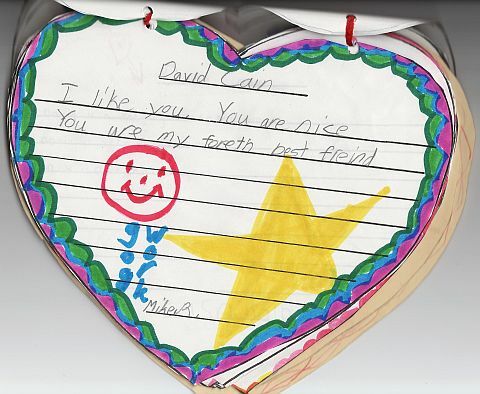 David, your post really captures the essence of what a child’s mind is really capable of. Creativity, innocence, and bliss all rolled up into one small package: a kid. I should’ve kept my schoolwork. Thanks for this. 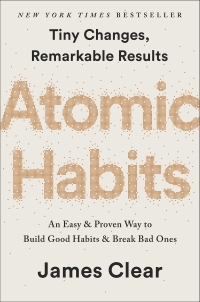 .-= John´s last blog ..How to Stop Temptations from Becoming Destructive =-. Drawing was one of my things too. After I got tired of drawing rocket ships, I started drawing pirate ships. I must have drawn hundreds in all. I should post some of them sometime. LOVE this post. 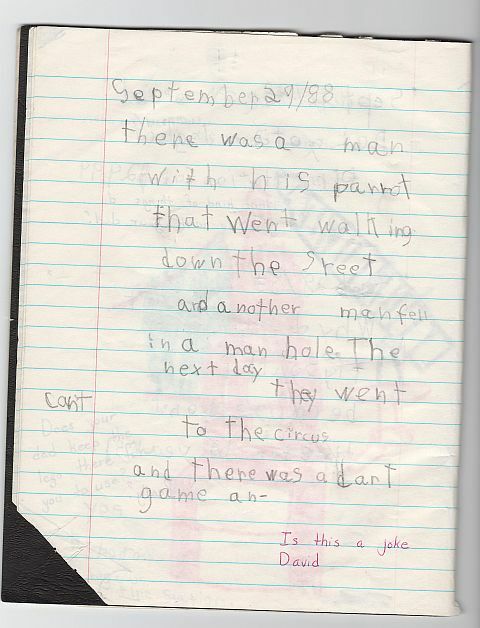 I have had similar fun looking at things I wrote as a young kid. My mother could probably fill a bank vault with the things she’s saved from my youth. But even better, I enjoy exploring the mind of my 6 year old through his writings, drawings, and conversations. It’s a wonderful kind of freedom that kids experience. Creative, random, and more often than not: brilliant. I don’t think children are here to learn so much as they are here to teach. .-= Craig | BloomVerse´s last blog ..Transforming your health with the Sedona Method: Part 3 =-. Kids certainly have something adults don’t. It’s almost a kind of wisdom that we somehow lose. You’re right, children are great teachers. Right in front of me at work, I’ve got some of my daughter’s latest artwork posted on the cubicle wall. I thrill in her creativity and do my best to nourish it. It sometimes even inspires me to get creative again! .-= Rev. T. Monkey´s last blog ..Someone has to do this: A fool and clown for God and humanity’s sake =-. I should pin up some of my stuff in my office. It might breathe new life into my workday. I like how you draw stuff. Can you let me go with your crocodile into space? It looks fun. P.S. I liked this story. It was very neat. .-= Lori´s last blog ..Your Body is a Fortress, Part 2 =-. You too Lori. You are nice. Your very smart. What a wonderful, fun post! What children have, which we forget quickly, is the innate joy of being, the playful curiosity about experience. Perhaps this is why so many of us like being around children and miss our youth. But it’s always there, the joy of being, it never goes away, we just manage to cover it up with rubbish. Thanks for a delightful article. Yes, that’s it exactly. The joy of being. As an adult I strive so hard to get back into the moment, where children already reside almost all the time. .-= Jenny Blake´s last blog ..Do More =-. Hey Jenny Blake, good to see you. If you do find some old Jenny schoolwork, you should post some on Life After College. I’d love to see it. David I was just fascinated right through this post. 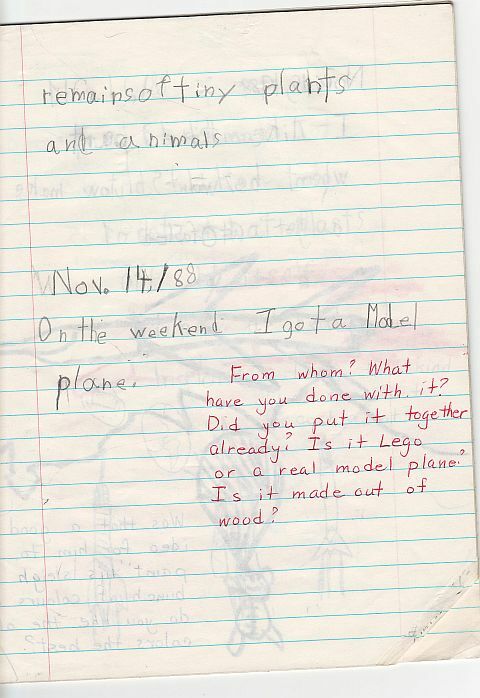 I don’t have any of my old school work, and now I really wish I could look back on it and get an insight into my eight-year old mind. That Valentine’s booklet was a wonderful idea, and it must be fabulous to still have something like that to look back on. .-= Hilda´s last blog ..The best things in life aren’t things =-. I have at least one other valentines day booklet like that, from grade one. It’s even funnier because the drawings are so simple and scribbly. There was so much material I could have included here, maybe I’ll do a sequel one day. Jeez, when I was eight, it was 1962. The Beatles weren’t quite here yet, Kennedy was not quite dead yet. What the hell was I playing at recess? Leave it to Beaver? I remember there were swings. .-= rgdaniel´s last blog ..Cherry Box with Cocobolo Lid =-. BTW I haven’t seen the word ‘Cocobolo’ for a long time. My dad was a real craftsman and hardwood connoisseur. There was purpleheart and wenge all over the house. Wenge was always my favorite. This post made me laugh, but I also absolutely love the fact that you have all these things saved. It’s amazing how much imagination we have as kids, and then as we get older we start to to be told things like “be realistic, be practical, don’t be ridiculous.” You are quite an artist :). .-= Srinivas Rao´s last blog ..How to break out of your comfort zone =-. That “Be practical, be realistic” message hit me a little too hard in high school. I stopped drawing, writing, and gave up on the idea of any career I might actually enjoy. Sad, really. Great post. Loved the old artwork! .-= HP´s last blog ..5 Steps To Jumpstart Your Business Adventure =-. Thanks, I’ve got so much more, too. now this is actually one great insight. Hi David — thanks for this. I have about 100 unfinished sci-fi/fantasy stories from when I was little. I think I’ve been avoiding fiction writing for a long time because of my fear that I’d never be able to finish a story — nonfiction has always seemed easier to complete. But I’m easing myself back in again these days. I used to love to write stories. As I got older I tried writing bigger and bigger stories, and finished them less and less often. Eventually I stopped altogether. Nonfiction has proved to be easier for me too, mainly because of the length, but I’m sure I’ll try fiction again one day. Reminds me of the scene in the movie “Uncle Buck” where Uncle Buck (played by John Candy) sees the principal of the school where his 6-year-old niece goes to school. The principal warns Buck that the niece is not serious about her career and future and is a dilly-dallyer and dreamer. Buck responds in kind by severely scolding the principal that she had better not even look at his niece in a bad way and that he wouldn’t want to know a 6-year-old kid who WAS serious about their career and who WASN’T a dilly-dallyer and dreamer. I guess I missed this post while I was out on my August road trip! I love it!!! This is the cutest thing ever. Oh, I was so mad at your teacher for stopping you right in the middle of your story (the one that may or may not have been a joke)! Time to move on, huh? When will adults learn to just let kids be? Wow I missed your comment somehow too. For three months! Wonderful stuff. I do have a few things from my school years including some artworks and artifacts I made, and some exercise books, but they’re all from hgih school. I wish I had some from primary school too. I will ask my mum next time I see her if she does have anything from primary school. The only thing she has given me is my school reports, and I must admit I occasionally read those to be informed, in very concise terms, of who I really am. I don’t think Ihave changed much because a lot of the comments my teachers made still apply to me now, if I’m totally honest with myself! I don’t think I have changed much because a lot of the comments my teachers made still apply to me now, if I’m totally honest with myself! Haha me too. I still draw in the margins, on the rare occasion I write on paper. A couple of months ago I met someone who had been in my class at primary school in England (I now live in Australia and this was on my most recent visit to the UK). I had not seen him or had any contact with him besides a couple of brief messages on facebook since we were in primary school together, which was 1985 (so nearly a quarter of a century ago!) and yet as soon as we started to share our memories of primary school, it was as if all those years and all the good and bad things they had brought had never even happened! Immediately it was like we’d been in contact all that time, and I felt like I was 10 years old again and I think he did too. For a couple of hours that day, all of that childhood honesty, spontaneity and simplicity came back to us. I intend to repeat the experience on my next visit this May and perhaps also meet a couple more school friends. It seems to me that I’ve never had such close friends since primary school. Somehow (perhaps because they’re often the first real friends we make) those are a particularly special type of friendship. One of the best drawings I’ve ever found of my own was a girl standing next to a giant soda can, which had been knocked over. She looked very alarmed and the can, which was bigger than she was, was spilling everywhere. Scrawled under the image was the title, “JAPAN”. I can only imagine what impressions I had about Japan when I was six years old. I DO have some of my old school work and I totally laugh at it when I come across it…my sister has NONE of hers…but I do. 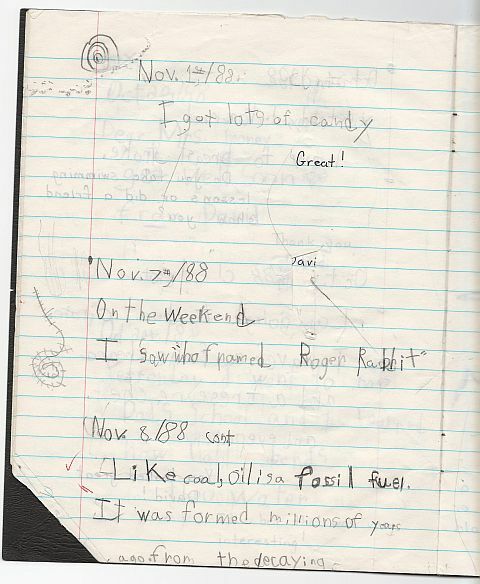 And, all she ever wrote about in her school work was food…in her childhood journal… food! I guess you know what was on her mind! Anyway…I totally relate to this post and thoroughly enjoyed it! U went to school in Winnipeg? In st vital? Mrsmoney is my mother in law!!! I have to send this to her! !